RV Camping is fun for the whole family. RV camping is a family affair. Whether you’re headed to the mountains, the beach or the woods this summer, you’ll probably be spending plenty of time out in the sun. Enjoying the summer in your RV means being outside in the sunshine all day and that can pose some serious health risks. But before you confine your family inside your RV for the summer, simply prepare all of your campers with these summer safety tips, and you’ll be able to enjoy your time outside without compromising your health. Whenever possible, avoid the sun during the hottest times of the day (between 10 a.m. and 4 p.m.) by staying indoors or using a portable sun shade umbrella. When you are spending time in the sun, protect yourself and your kids with UV protective sunglasses, clothing made from sun-protective fabrics and plenty of sunscreen (SPF 15 or higher) on areas that are not already protected. Awnings and a portable sun shade umbrella are a must have for RVers that camp under the hot sun, or when a summer shower passes over. But often, you need shade or rain protection, such as over your picnic table or at a prime view spot away from your RV. 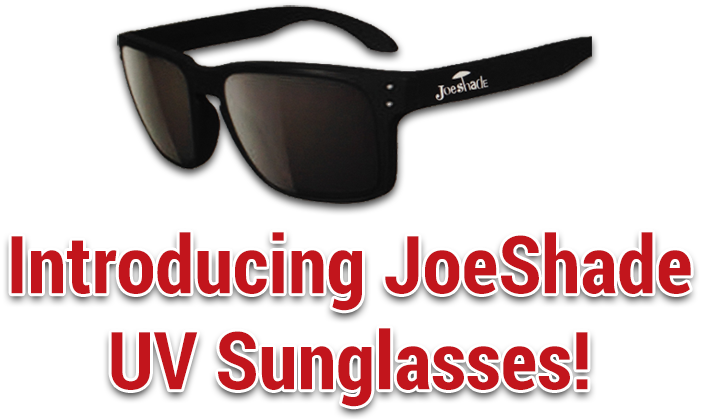 That is when you need instant shade like JoeShade, portable sun shade umbrella, which will protect you from the sun’s burning rays that are damaging and know to cause skin cancer. Planning ahead and bringing along your RV essentials will keep your family protected and comfortable. Let your JoeShade® portable sun shade umbrella make every destination a “cool” place to call home!